At Copenhagen Airport on a busy day there are about 850 take-offs and landings. It is the tower controller’s job to manage take-offs and landings on the runway - so they are the ones issuing the permissions: ”Cleared to land” and Cleared for take-off”. 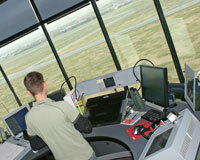 The tower controllers are also responsible for safe aircraft taxiing between the gates and the runways. The tower controller sits in the control tower and can see all aircraft and surface vehicles at the airport - as well as the aircraft in the airspace in the immediate vicinity of the airport. The tower controller uses a variety of information in order to maintain the required separation between aircraft as well as between aircraft and surface vehicles at the airport. Tower controllers receive information both visually out of the tower windows and by referencing a radar display. Prior to departure the tower controller gives the aircraft clearance to fly in the controller’s airspace section. This clearance contains a certain air route to be followed, an assigned altitude or flight level and a four-digit transponder code that identifies the aircraft on the radar display.